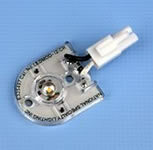 Completely self-contained under counter light fixture with replaceable 120VDC LED Modules included. Dimmable. Twice the light output as Xenon/Halogen technology with 72% energy savings. 120VAC in and out up to 150 replaceable LED Modules per 15A tap. Numerous contractor preferred 1/2" knockouts in each fixture. Offered in five sizes and four fixture finishes. UL Listed Damp Location.